In January 2000, 29 Osceola Wild Turkeys, 10 with radio collars, were released into the Long Pine Key area of Everglades National Park. Park officials led by Dr. George Dalrymple thought the timing was right. The last major strand of pineland in Southeast Florida was finally robust enough after decades of logging had ended and a natural fire regime had been restored. Since hunting was prohibited in the National Park, the turkeys would seem to have a bright, protected future. Excitement however turned to despair after 7 of the 10 radio-collared turkeys died within a year. Animal predators were suspected, but never proven. 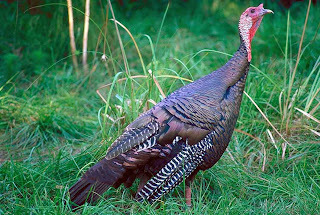 Although once widespread, the Wild Turkey’s habitat was destroyed by logging by the early 1900s and the Osceola Wild turkey, the Florida variety once common in Long Pine Key was no exception. Dalrymple, the scientist behind the 2000 turkey introduction, lost his own battle with cancer in January 2005. In response to his death, exactly one year later, another 31 wild turkeys were released into Everglades National Park under the auspices of the National Wild Turkey Federation. Initially things looked good for the turkey transfer. Numbers were up. But by 2009, the Park’s turkeys were in decline again. It’s not certain how many are left. Sightings have been rare. The Wild Turkey was one of three pineland birds reintroduced into the Park. The other two were the Eastern Bluebird and the Brown-headed Nuthatch. What can we take away from this wild turkey story? Maybe that it reaffirms nature’s delicate balancing act. A few degrees more here, a few feet less there, a dozen fewer births one year. A seemingly endless number of variables determine the future. I don’t know what ingredients are necessary for Everglades’ turkeys to survive just as I don’t know what actions will ultimately be necessary to sustain our state animal, the Florida Panther. We’ve done our damage. We let things go too far. All we can do now is help set the stage for recovery and let nature take the reigns. On this Thanksgiving, let’s give thanks for the wild lands others had the conviction and tenacity to save, the ability to use our brains to find solutions, and the wisdom to protect what nature has already provided. Oil Disaster Forum: What Do the Scientists Know? Tell Sen. Nelson: "Don't Feed the Toxic Algae"